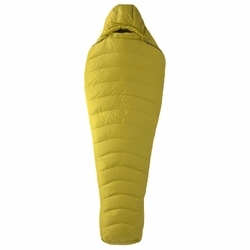 Marmot Hydrogen 30 Sleeping Bag. We didn’t think it was possible either, but the Hydrogen is even lighter and more packable than before. The new curved baffles on this bag reduce shifting of the down, allowing this bag to provide enough warmth for cool-weather climbs and backcountry excursions; a new easy-access, fold-down second zipper allows easy ventilation. At just a pound and a half, this bag puts the ultra in ultralight.